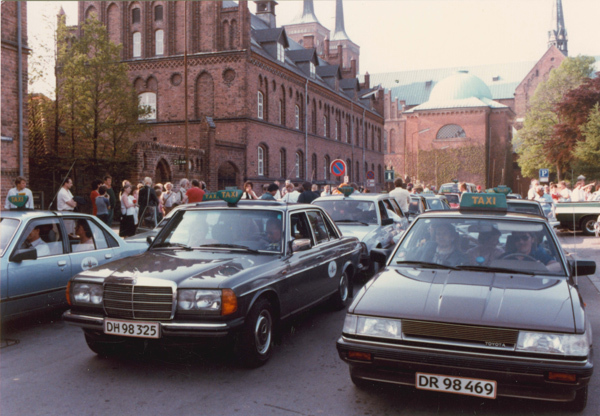 In 1985, the Roskilde Taxi Company had 30 taxis, all equipped with state of the art radio communications. The radio operator was able to call all the taxis or any number or combination of them. Likewise, any taxi could call another taxi or combinations of other cabs. 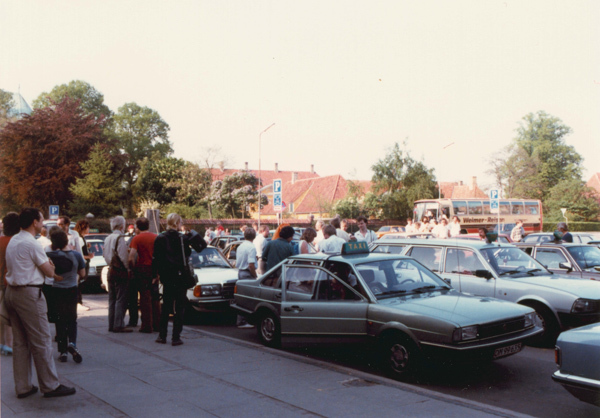 After the opening reception of the Festival of Fantastics, the 30 taxis lined up on Stændertorvet, the main square in town, and reception guests were invited to climb aboard for a free ride. Approximately 120 passengers made the 45-minutes trip. Unlike a regular taxi ride, the taxi drivers had secretly been told that it was up to them to decide where to drop the passengers off, where to go and which route to choose. None of the driver was allowed to reveal the purpose of the ride; he was simply to keep the passengers entertained with chatty conversation about topics of current interest. Along the way Eric Andersen would over the radio tell the passengers what to do. He might ask them to look out the right-side window, instruct the rear seat passenger to talk about his children, grandchildren or other relatives, ask the front seat passenger to express his political views or tell the driver his annual income, encourage all the rear seat passengers to burst into song, instruct the taxi to pull over so passengers could swap seats, ask a passenger to give the driver a kiss on the cheek etc., etc., etc. Sometimes instructions were received by all the taxis, at other times they were only transmitted to a number of carefully selected vehicles and once in a while only one cab received the instructions. Everything was carefully controlled by the radio operator to make sure that all the taxis would receive the same number of instructions during the 45 minute ride, although mostly different instructions. After 15 minutes all the passengers were encouraged to send similar instructions to the other taxis. When the 45 minutes had passed the passengers were dropped off at a location determined by the taxi driver. All 30 taxis then left to take a 15-minute break. The performance meant that no one in Roskilde and environs was able order a taxi for a whole hour. This work for taxis is one of several extraordinary collaborations between Roskilde Taxi and Eric Andersen. 6PM ROSKILDE TAXI - an event by Eric Andersen. 120 people in 30 taxis took part, following instructions he relayed to them over the intercom system. We rode with Bob Watts, a translator (who was told to get out of the car along the way), a video camera-man and the film projectionist. Bob did most of the talking, Emmett fell asleep. The most interesting confrontation was with a plain clothes cop, a plant whom Bob saw through in a minute and the most unexpected event was the order for all to get out of the taxi about 5 miles out of the town and find our own way back. Emmett was not amused.